We at InstaCrypto are happy to announce that we’ve crossed the century line and now in under a month!!! And we have our clients to thank for that. One of InstaCrypto’s ideologies includes being as indigenous as possible. We’d rather share our profits and investments with the InstaCrypto family rather than dole them out to marketing and social media giants that support the centralized monetary system. In order to show our appreciation, we would like you to have a slice of our pie. Refer a friend and get a Rs.100 discount coupon redeemable on our site on your next transaction. Your referral also gets Rs.100 discount on their first buy order. It doesn’t end there…InstaCrypto users that refer more than 10 customers can get rewards including discounted processing fees, invitations to meetups and get-together related to our products and services. Once registered and KYC verified, find your unique referral link on your profile page and share it with your friends through email, whats app and social media. 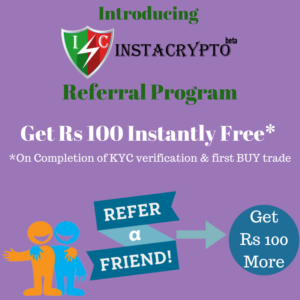 When your friends use your link to register, get KYC verified and place their first buy order, they will get Rs 100 off instantly. You will Receive a coupon worth Rs 100, which you can use during your next buy order. The more you refer, the more coupons you would receive. Visit ‘Refer A Friend‘ section in your InstaCrypto account to share and keep a track of your referrals. This entry was posted in Referral Program. Bookmark the permalink.